Saturday 5am is the start of the first of two Craftys challenge weekends, we will be fishing within our normal club boundaries and weigh in is at the fire station 12pm Sunday. So to clarify you must weigh in a SSH before any other fish will qualify, break out the Crabs, Prawns or cray. 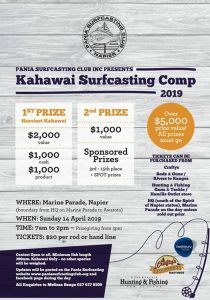 prizes will be for Heaviest Snapper, Heaviest other, Heaviest kahawai and Average Kahawai, best fish junior, and don’t forget the chocolate fish prize. 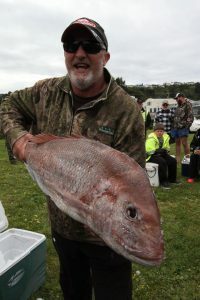 So options for this weekend, open, go anywhere in NZ salt water only, start fish 6pm Friday weigh in 2pm Sunday at the fire station. Last Sunday was the 1st club casting day for the season. Not a big turnout for this in the end. Well done Jim Yeomon with a 171 meter cast. Also a reminder, club meeting this wednesday, 7.30pm at the napier fire station. Please come and support your club, have your say, socialise. Just a reminder that the 1st club casting day is this Sunday. Streetwise coffee once again sponsored field weekend one. The first weekend of the new season kicked off with excellent sea and weather conditions. Most members fished locally, with mixed success. Well done to all members who weighed fish. Standout catches included the blue moki weighed by the 2 Andy’s, the gurnard caught by Andy B, James B and Dion and of course the monster pin kahawai (2.54) caught by Xavier Benge! Well done Xavier! Once again, a huge thanks to Streetwise coffee for there on going sponsorship. Please take the time to support all our generous sponsors. Good luck to all members fishing field weekend 2. Remember this is an open field weekend, meaning you can fish anywhere with the weigh in being at the later time of 2pm at the fire station. Well,Trish from both the Corner Cafe and also Creative Landscape and Design drew our first jackpot fish and it was the KINGFISH 85cm or over. Streetwise Coffee field Weekend one kicks off this weekend, normal boundaries apply. ( Mahunga in the north through to Herbetville in the south ) normal start time 5am Saturday with weigh in at the fire station 12pm Sunday. Just fantastic north to northwest winds with a swell of between .50 to .80 of a metre all beaches will be fishable. I know some will be targeting Awatoto through to Te Awanga reef, all that shell fish washed up over the past week !!! Not sure any of the rivermouths will be producing but you never know. Heading north or south take your pick it all looks great. Last year our first weekend produced 105 Kahawai with the odd gurnard, barracuda, and smoothhound, and of course the infamous red cod. 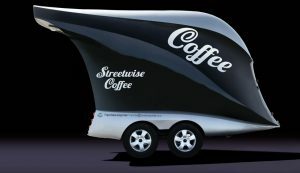 Good luck everybody please support Streetwise and grab a coffee if you are passing one of their carts in Napier or Hastings. As most of you are aware the council have installed a gate to block access to the grass for parking and weigh ins.